Tropical rainforest meets the Pacific Ocean at this tranquil boutique resort, a true haven for those seeking an intimate atmosphere and absolute adventure. The perfect combination of pure relaxation and exhilarating action, this oceanfront paradise offers mind-blowing surfing at Frigates Passage, world-class diving in Bega Lagoon, famous Fijian hospitality, a variety of beautiful bure accommodation, and excellent dining. Conveniently located 20 minutes away from the ‘Adventure Capital’ of Pacific Harbour, yet totally secluded in the midst of the rainforest on a private lagoon. Panoramic Ocean View Room – One bedroom with Queen-size double bed and one Full-size single bed (different set-ups available on request), and a large verandah. Deluxe Ocean Front Bures - Two beds, one Queen-size and one full-size (different set-ups available on request), table and chairs, ceiling fan and large decks with sitting corner and 'hammock chair'. Superior Deluxe Ocean Front Bures - Two bedrooms, one master with Queen-size and one Full-size bed in the 2nd room, a sofa sitting corner with large coffee table, walk-in closet, table and chairs, ceiling fan and large decks. Fiji’s warm, clear waters and abundance of reef life make the islands a magnet for divers and snorkelers. Visibility regularly exceeds 30m. In terms of visibility the drier months of April to November are more reliable, but in different seasons the diver will experience different things and diving is quite good year round. Many travelers take the opportunity to learn scuba diving while in Fiji. Our special location close to world famous Beqa lagoon and the amazing variety of local reefs offer an exceptional diving experience. Coral Coast diving offers unexplored diving as well as many dive sites of world renown such as sites in and around Beqa Lagoon. However, there is no such thing as the ‘best’ diving site, especially in Fiji. Every dive site has something special or unique to see and dives range from safe and easy to wall dives in fast currents. The main advantage of diving on the Coral Coast is the proximity of sites to the coast. The inside reefs can be reached by small boat, currents are usually moderate, and you will see good coral and reef fish. To see bigger pelagic fish and spectacular coral, we will take you to dive the outer reefs and passages. The reef surrounding Beqa is considered one of the world’s top diving locations. Beqa Lagoon, a 64-km barrier reef is famous for its dive sites which include Frigates Pass, a 48m wall dive with large pelagic fish including reef sharks; and Caesar’s Rocks with amazing coral heads and swim throughs. Waidroka Bay Resort has a full service PADI Dive Shop on site, offering one, two or three tank dives. Waidroka Dive offers well maintained equipment for those that prefer to rent their equipment. We offer dive excursions to dozens of world famous sites along with PADI courses catering to complete beginners through to professional level divers. Come explorer our abundant and unspoiled hard and soft corals and brilliantly colored walls in clear warm water just minutes from the resort. Whether diving through passages, caves, clearings, or the wreck of the “TASU No.2” with visibility ranging from 50 to 150 feet you will have the opportunity to view sleeping sharks, rays, turtles, dolphins, and an incredible variety of fish. We have it all! For the more adventurous, there is Aqua-Trek’s Ultimate Shark Encounter, about a 30-minute drive from Waidroka Bay Resort in Pacific Harbour. 2-tank Ultimate Shark Encounter is available on Monday, Wednesday, Friday and Saturday. Make sure you book far in advance! Super selection of rights & lefts only 10 minutes boat ride away! Surfing in Fiji is world class all year around. 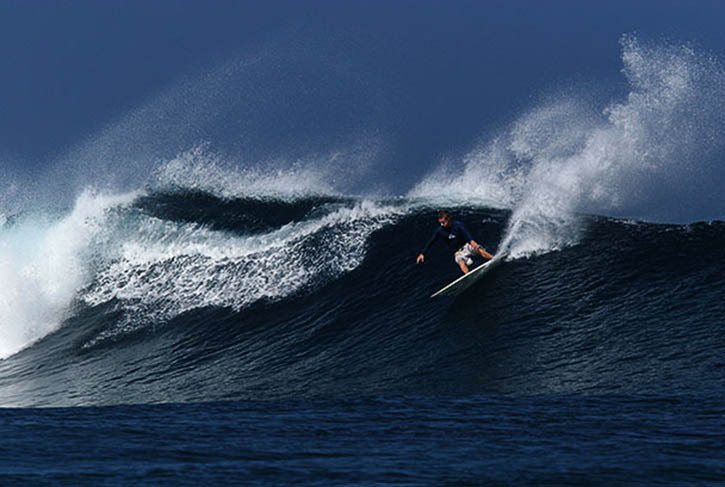 The pacific swells break on the various reefs right outside the resort and presents a variety of un-crowded waves. Waidroka Bay is the ONLY main island resort that runs surf trips to ‘World Famous Frigates’ and is the only resort that surfs ‘Pipe,’ ‘Resorts Left', ‘Serua Rights’, 'J's' and 'Shifties'. With a large selection of rental surf boards, body boards, helmets, rash guards and booties, a Waidroka Surfing Safari is at your finger tips. The Trip to Frigates Passage takes approx 45 minutes and local spots only 5 – 10 minutes from the resort. Waidroka is renowned for its great surf year around and has a variety of surf breaks at your fingertip. The Trip to World-Famous Frigates Passage takes approx 45 minutes and local spots are only 5 – 10 minutes from the resort. Traveling in comfort aboard the ‘Fiji Explorer,’ a 30 foot catamaran style boat with a full roof, padded seats and toilet, or it might be ‘Wave-Rider’ or the ‘Wave Hunter’ that heads out, all twin engine boats with GPS, VHF, boat captain and surf-guide. Which ever the boat, it remains with you while you enjoy the world class waves at some of the best surf breaks in the world. Between sets you can relax in the shaded comfort of the boat and enjoy lunch, snacks, drinks and stories from your Fijian guide. Surfing in Fiji with Waidroka Bay Resort offers an incredible experience for beginners, intermediate and mostly experienced surfers. Frigates (Left): World Class and one of the best surf breaks in Fiji and the world! Frigate's is a powerful and consistent hollow left. Big barrels, long rides, and works at all tides! Most surfers that had a few sessions at Frigates will come back to Fiji to surf again and again. Works at all Tides! Resorts Left: Fun lefthander. Good surf break for beginners and long boards. Pipe (Left): Peaky left. Pure super-fast barrels. Experienced Surfers. Mid to high tide break. One of the best surf spots in Fiji for barrels and also body-boarders. Serua Rights: Great long right hander. Mellow take off going into hollow inside section. On big days this is one of the longest waves surfing in Fiji offers. J's (Right): J’s is a super hollow, fast and barreling right hand wave that breaks from 2’ to 6’. It works best around the high tide with off-shore or cross-offshore winds from NE to W. It likes a bit of west in the swell to run all the way down the reef. SHIFTIES (Right): deep water pyramid like take-off. An outside point of the Reef picks up all the swell and will pick up more swell than any other break around. It 's powerful and thick. When everywhere else has very little swell and waves there will always be a wave at Shifties. It can be surfed at all tides. Surf with us some of the best surf spots in Fiji. Surf spots are working in almost all conditions. Local boat rides take no longer than 10-15 minutes. All breaks are reef breaks which develop into super breaks even at the lowest swells. Swells are consistent and when the big ones roll-in the Surf, both locally and especially at Frigates becomes absolute World-Class! Come to Waidroka to enjoy Surfing Fiji at it's best!